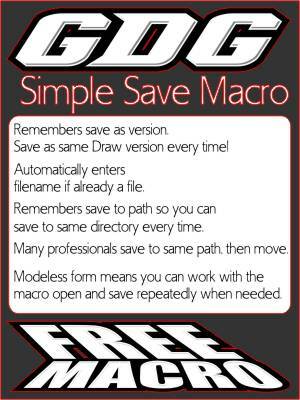 Free macro for saving in Corel Draw. Remembers version, and path so you can save to the same path every time and to the same version of Draw as well. A modeless form means you can continue to work and click save, modify the file, or choose another, and click save again. Works great when you have many files to save or just want a simplified saving macro! Save as same Draw version every time! filename if already a file. save to same directory every time. Many professionals save to same path, then move. macro open and save repeatedly when needed.